If you take a trip back to the 80s, you might remember a major war. No it wasn’t a war waged on foreign soils over oil, communism, terrorism, or politics. This was a war of lipids, an attack on all things fat. The fitness community slightly influenced by the medical community, and heavily influenced by the media, launched a campaign against fat. Then as the times went on and the 90’s came upon us, fat and fitness came to an understanding and a new war was declared…on CARBOHYDRATES. Much like the U.S. Constitution is the supreme law of the land, this is the law of carbohydrates. Perhaps one day your kids or grandkids will learn about it in school. Or perhaps that is my delusional fantasy. But here we go. A carbohydrate is a molecule made of carbon, hydrogen, and oxygen (yummy). They contain 4 calories per gram and are one of the three macronutrients. They are easily identifiable based on their origin of coming from the ground. Any food that can trace its origin to the ground (plant life) is a carbohydrate. Wheat, oats, vegetables, fruits, and even sugar all come from plant life grown in the ground. They are a vital part of your diet in their varied forms and one of the main sources of fiber, minerals, and vitamins in all the foods we eat. Carbohydrates can be broken down into two categories, Simple & Complex. Those groups each feature sub categories. *Maltose is a broken down starch. It is found in malted drink mix, and fermented starchy foods like bread and beer. Starch can also be a processed polysaccharide like maltodextrin. These are usually used as food additives to enhance taste and mouth feel of food as well as a thickening agent. Starch as a complex carbohydrate digests slower in the body and is optimal to consume over simple carbohydrates like sugar. Examples include wheat, brown rice, oats, and sweet potato. Fiber is found in fruits and vegetables as starchy foods like whole wheat, brown rice, oats, quinoa, and sweet potatoes. White foods like white bread have the fiber and germ of the wheat removed to make it taste lighter. This also causes the food to rapidly increase blood sugar leading to weight gain and metabolic disorders. It has been proven that a diet high in fiber can reduce LDL cholesterol levels and prevent disease like colon cancer and diabetes. Fiber comes in two categories, soluble (dissolves in water) and insoluble. Soluble fiber sources include: fruit, vegetables, oats. Insoluble fiber sources include: wheat bran and whole grains. Fiber can take many forms that appear in foods in one or more of those forms. Resistant starch is a dietary fiber that “resists” digestion in the body. Resistant starches are in essence balking agents that can help you feel full longer, though their attributes as a weight loss aide are still debated in medical circles. Different foods can be made up of one or more types of carbohydrate depending on their genetic makeup or how they are processed. Simple carbohydrates include: sugar, soft drinks, candy, fruit, milk and dairy. Why is fruit in this category? Fruit contains fructose (see above). However, the fiber content of that fruit slows the digestion of the fructose sugar and the body must convert it to glucose. How do we use all of this information? It has been proven that complex carbs are optimal to simple carbs for weight loss, weight maintenance, and overall health. 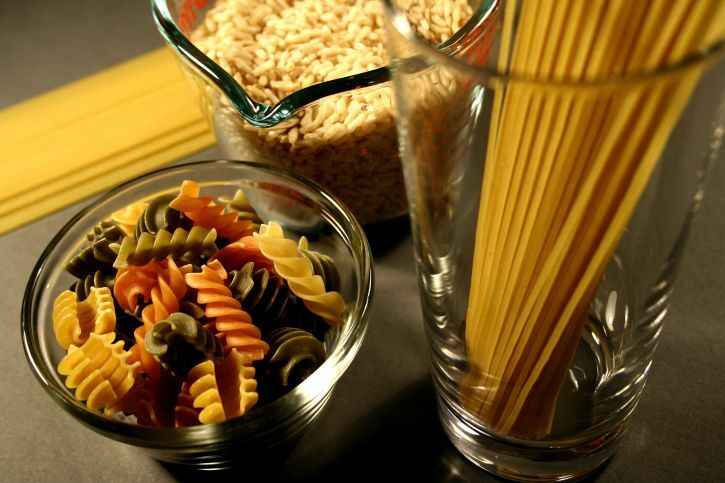 Furthermore, carbohydrates are the only source of fiber which is vital to a healthy diet and digestive function. The best way to incorporate the different types of carbohydrates in your diet are based on energy usage. Starchy carbs and even simple carbs are best for high energy times. This is within the first six to eight hours upon waking when you are physically active as well as before bouts of exercise. In low energy periods like within five hours of bed and on days you are not physically active it is best to stick with fibrous carbs like vegetables. Simple carbs like sugar (mostly in the form of dextrose) have been shown to be important to post resistance exercise recovery as well as rapid glycogen replenishment (think Gatorade). The key is to find a balance. While the bulk of your diet should be complex carbs from starchy and fibrous sources, we also see where simple carbs have their place. It is even acceptable and beneficial to enjoy the occasional simple carb food. When planning your carbohydrate intake consider these factors. Your daily energy expenditure. Are you an athlete? Do you work out regularly? Are you physically active? Do you do manual labor work? Are you sedentary? Do you work a desk job? What is your body weight and type? Are you obese, thin, or in good shape? Do you work out to build muscle? Ae you diabetic or have other metabolic disorders? Does your body handle starch well? Can you eat complex starchy carbs and maintain a healthy weight? Or is your carb tolerance lower and you need to stick more with fibrous vegetables based carbs. Knowing the types of carbohydrates and how they can affect your weight, your body fat, and your energy levels is very important. Use this carbohydrate constitution to guide you on your way to better results through knowledge.